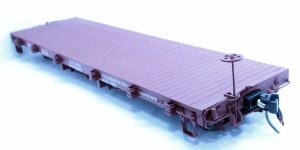 AMS On3 & On30 flat cars have been around for awhile but they get little mention so we’ll start this piece with a bit of a review. The model is a ready to run model of a D&RGW 6000 series flat car that has been produced in a variety of other liveries and for both On3 and On30 track gauges. That raises a couple of points noted below but for now on with the model. 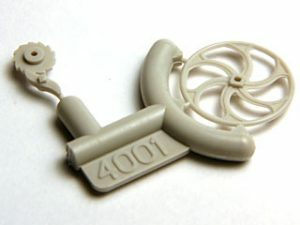 The model is a combination of metal and injection moulded parts that make a very credible model with just a few reservations some of which may be put down to making the model robust for general use rather than as a fine scale model whilst some others are just poor efforts but from a distance it makes an acceptable model. 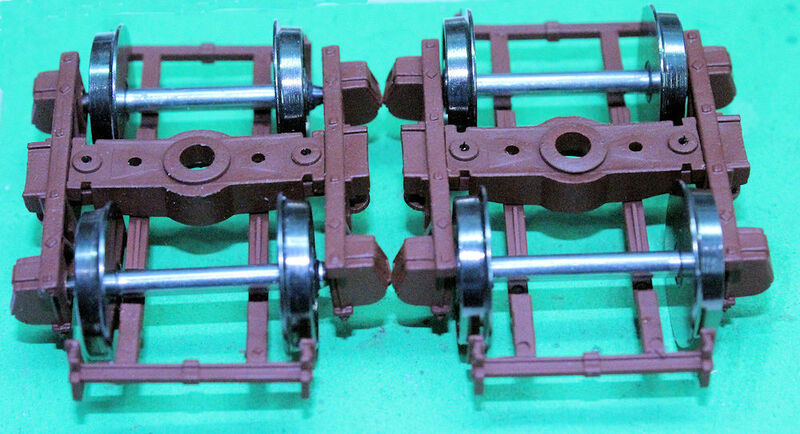 The problems I have with the model are the mickey mouse couplings, over scale air pipes, turnbuckles and brake wheel. So a basically sound model with some clumsily executed details. The issues raised will be explored in the following article as non are insurmountable. [Please remember the following price discussion is based in the UK] I currently have the models in stock, but 0n3 gauge only, at £27.50. This compares very favourably with the Bachmann flat cars which are smaller but would be around £32 at most UK retailers. My UK price for them is pre-exchange rate plummet. If I were to order a new supply of the AMS cars then they would be somewhere around £40. Okay, so we’ll deal with changing the gauge first. The only difference between the On3 & On30 trucks is the gauge of the wheelsets and the wheels are a press fit on the axles so, simplistically, all you need to do is slide the wheels along the axles. In practice of course a little more control is required so this is how I do them and the tools I use. S o what have we here? 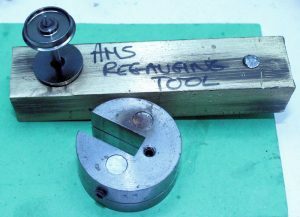 The round thing is a back to back gauge and, in all honesty, its the sort of once in a lifetime purchase that any serious modeller should have in their tool kit. 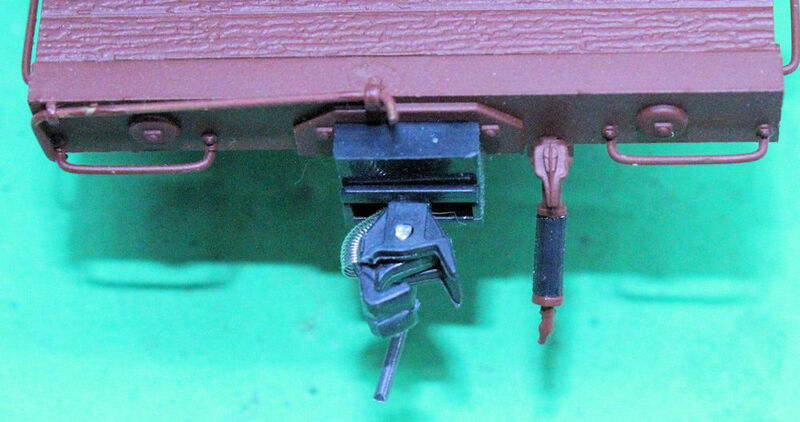 This one is an adjustable unit bought from GW Models. The other thing says what it is on it. Its home made from a chunk of brass and has a tapped hole drilled through it. There is a grub screw in the hole as a depth stop and another to lock the first. Its not essential but if your going to do a few then it makes life easier once its set up. 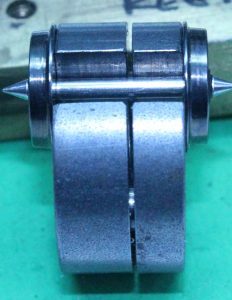 When first used the wheels on a wheelset are pushed in too far then, with the grub screw set near the top, the axle is put in the hole and the wheel pressed to the block. The other wheel is then done at the same settings. Then check the wheels against the back to back gauge and adjust the grub screw up or down as required. When its set right, takes about 10 minutes, all subsequent wheels can be done on it moving the wheels a set distance from the end before a final check with gauge. Its advantage is, once set, its quick and you are ensuring that not only are the wheels to gauge they are central on the axle. With a bit of preparation you can quickly change the gauge of trucks. Undo the pivot screw to remove them from the car, pop the wheels out (you have to remove the truck to remove the wheels to the top as the brake gear stops them coming out from below). Sort the wheel as described above, pop them back into the truck and screw the truck to the body. Job done. 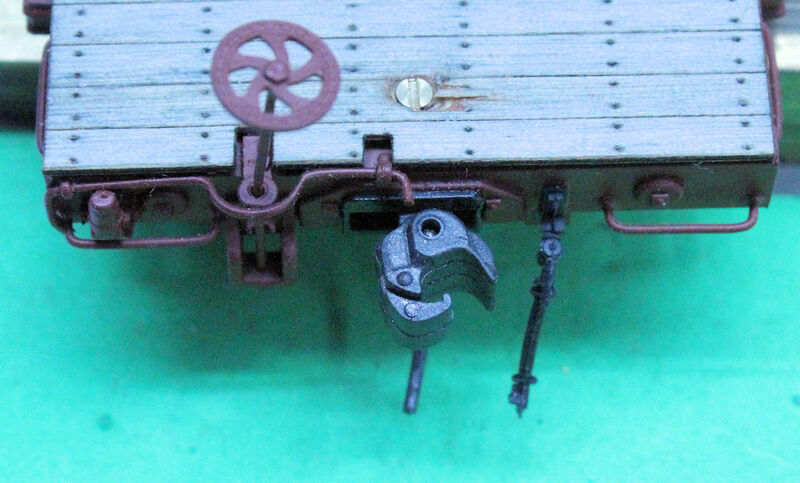 The biggest bodge on the model is the couplers. 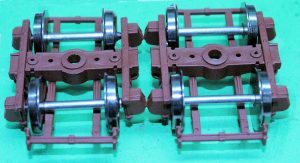 On3 and On30 have different coupling standards. 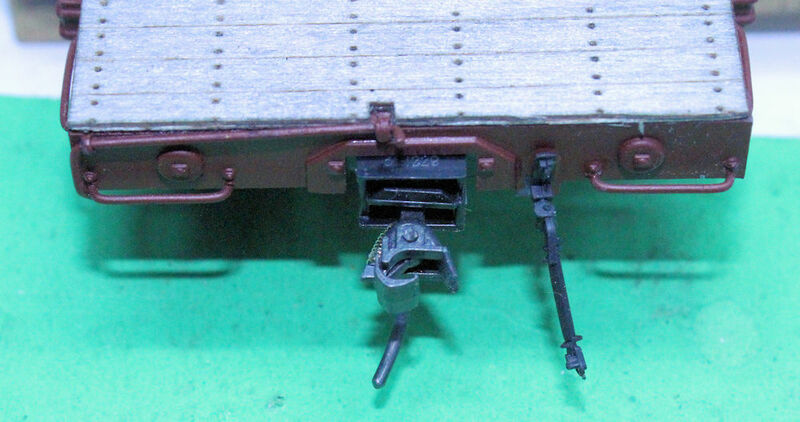 On30 uses HO couplers at the standard HO height. On3 couplers are larger and set higher up. Rather than either copy an established design or buying them in AMS designed their own universal coupler in an attempt to do both scales with one. As with most universal things it does neither well. The spring tensions are all wrong and the shape of the knuckles is not conducive to reliable coupling and it doesn’t even look the part. One can’t help but wonder if they had to make them sufficiently unworkable to avoid patent bother with Kadee. Whilst there are probably endless options for sorting the couplers out I have three for you here. This first picture shows the AMS coupler set down with a spacer t0 On30 height. A key thing to note here is that the coupler is set proud of the end of the wagon where it ought to be pretty much flush. I think this is a compromise to get the wagons to go round 24″ minimum radius they claim for the models. So an option in either of the two following suggestions is to fit the new coupler flush or proud. This option is an On3 San Juan Evolution Coupler set at the On3 height (directly on the car floor) and flush with the end of the car. Its actually on one of my On3 cars which run with MMI K classes which need 30″+ radius curves so flush is OK. 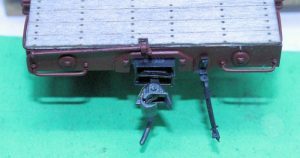 This option is an On30 option using a Kadee 148 whisker coupler and a second coupler draft box as a spacer to drop it to the correct height. You could, of course, use styrene sheets as spacers. Both are overscale by a large margin. The AMS air brake pipe must be about 4″ diameter. 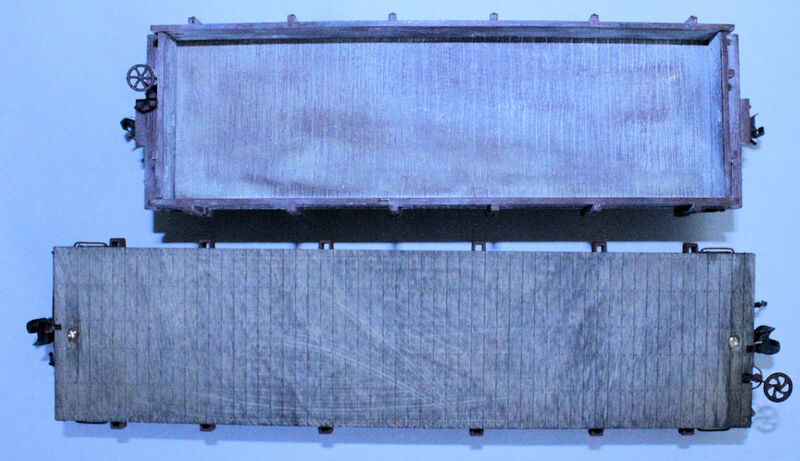 I replace them with San Juan Car Co ones moulded in rubber so not only are they scale they bend rather than snap off. You’ve seen glimpses of this in the pictures above but this really makes a difference. Banta Models make a self adhesive laser cut deck. There are a couple of raised details to carve off and then its simply sticks on top of the model. When I remember I do all the coupling fixing screws and the like before stick it in place. Finally, once stuck I stain it with our weathered wood stain.